Shown here in a small serving, because we ate the rest. 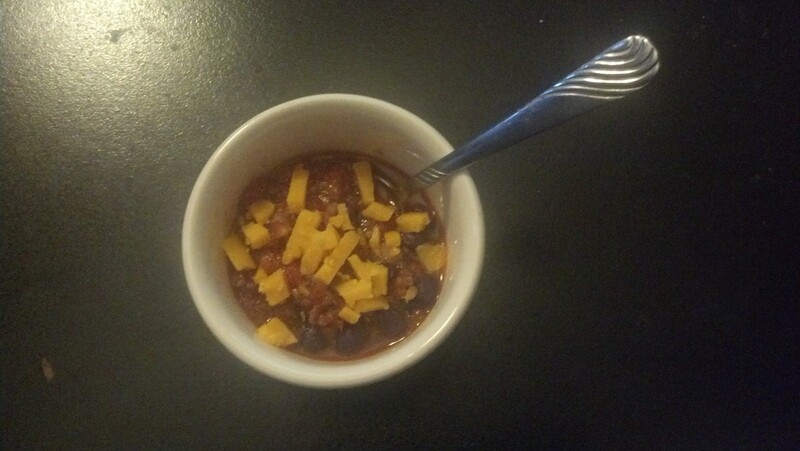 I wanted to make a homemade chili that used as few canned goods as possible. As you may be aware, canned goods, especially tomatoes, tend to have high levels of BPA. This recipe does take a while, but does not require much effort, especially if you have a food processor. First run ½ of a large onion, 2 cloves of garlic, ½ green pepper, and the red pepper(s) of your choice through a food processor. (Newbs: slice first) Add to large skillet with beef. Brown. Drain off fat if necessary/desired. Slice and food process 4 large tomatoes, then add them to the beef along with the desired spices. For a mild chili, add only 1 T of chili powder, 1 T of cumin, and omit cayenne pepper. After mixing well, bring it a boil and then turn down the heat and let simmer for 1- 2 hours. The longer you let it simmer, the more spicy the chili will be. If you are using dried black beans, begin to prepare them while chili simmers by covering them in 5 inches of water. Bring water to a boil and reduce heat to simmer and cover. In one hour, remove from heat and drain. Also prepare rice or quinoa according to package directions while the chili simmers. Just before serving, add rice (or quinoa) and beans. If desired, top with cheddar, sour cream, or both. Great alone or with crackers! Also tastes great served on top of a baked potato. If you actually only wish to make a 1/2 cup of prepared rice, use 1/5 cup rice and roughly 2/5 of water. Water will boil away faster if you cook it this way, so you will have to check on it periodically.